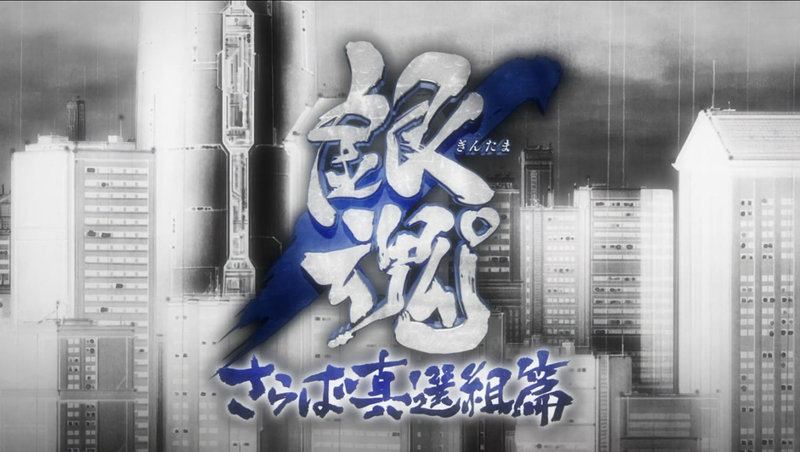 Anyway, moving away from reality now to the world of Gintama. The Farewell Shinsengumi Arc immediately follows on from the Shogun Assassination Arc with Lord Shigeshige's funeral and changes in power. Lord Nobunobu is the new Shogun, and with him come some changes to our beloved Edo, and people aren't liking it. Not that he gives a damn; he's the Shogun and he's gonna do as he pleases. And for one, he wants to get rid of our beloved Shinsengumi because of their ties with Lord Shigeshige. Yes guys, the Shinsengumi is being disbanded for good! How does this happen you ask? Well, he sends Kondo and Matsudaira to prison in order to prevent Hijikata and Co from rebelling against him. Things don't look so good for them until Katsura shows up in prison with them. How I wanted him to come into the Shogun Assassination Arc. I missed the "Zura ja nai, Katsura da". But his presence does not go to waste my fellow readers. While those three are there, Hijikata and the others must come to terms with what's happening and decide their next steps. Not that they have much of a choice, because no matter what they do, Kondo's life is at stake. And Nobunobu showing up where everyone least expected him to doesn't help. But then again, we do have Gintoki to help us out here. Afterall, he doesn't care what he does to people he doesn't like amirite? Gintoki showing up does help Hijikata out, and he decides to don the Shinsengumi uniform once again and lead the rest of the Shinsengumi on a rescue mission to save Kondo and Matsudaira, and join forces with the Joi Rebels. But there is more to this, as the Mimawarigumi, who have now been appointed by Nobunobu, are around to add some depth to the Arc. It's pretty emotional in relation to Sasaki and Nobume's stories, and it's quite touching how they have a much deeper bond that just Captain and Vice Captain of the Mimawarigumi. And that's not all the depth to the Shinsengumi Arc, for the wicked do not rest. By wicked I mean the Naraku. Turns out they're somehow involved in the goings on which are happening whilst Hijikata and Co are on their rescue mission. And they bring another surprise with them too which I shall not mention here. It is pretty big though. This is a pretty serious and deep Arc, especially since it follows the Shogun Assassination Arc straight after. What brings some warmth to you as you're watching is it that, while the fighting and what not is happening, we get to see flashbacks of when the Shinsengumi first came to Edo in order to make a name for themselves and pursue their dream of being samurai, and how Sasaki, Nobume and the Naraku are connected through their backstories. I like how the Gintama universe is expanding its characters, and by switching between past and present, it does add to the emotion as you see how bonds have formed over the years and why everyone has made the choices they have in this Arc. It's pretty amazing. So yeah, the Shinsengumi are basically gone after all is said and done in this Arc. It is a great send off to them, seeing as how we got to see them in a whole new light. The same can be said to the villains of the Arc. You come to know what everyone is fighting for and the risks they're willing to take in order to saved loved ones. Hopefully the Shinsengumi will be back; their craziness will be dearly missed. Until then, we still have the Odd Jobs trio and more to look forward to!